If you’re looking for investment opportunities in the Asia-Pacific region, the Australian digital sector is on the rise. Management consulting firm McKinsey & Company refer to digital transformation Down Under as the ‘fourth industrial revolution’ and recently predicted that it will contribute AU $140 – AU $250 billion to the nation’s economy by 2050. Many of the industry’s major figures will meet at the 2019 Digital Marketing Innovation Summit in Melbourne between March 14th and 15th, so it’s the perfect place to network. If you’re planning ahead, here are a few top tips for attendees. Flying to Melbourne from the US isn’t as complex as you might imagine and depending on your departure point, you can be there in under a day. For instance, you can fly non-stop overnight from LA with Virgin Australia — getting there in just 15 hours, 45 minutes. Meanwhile, if you’re travelling from Hong Kong, you’ll reach Melbourne in just over nine hours with an airline like Cathay pacific. Brit digital entrepreneurs will have no trouble arriving on time either. A Malaysia Airlines flight from London will get you there in 23 hours, 30 minutes — with a two hour, 20 minutes layover in Kuala Lumpur. There’s no denying the latter option will test your long-haul mettle, so prep your Spotify playlists, pack a good book and make the most of in-flight entertainment. You don’t need pre-flight parking hassles either — check a reliable comparison site like Looking4.com to find a convenient valet service. Previous speakers at the Digital Marketing Innovation Summit include top thought leaders like Lea Wright, head of customer engagement and correspondence at National Australia Bank and Jodie Osbourne, senior digital and UX manager for News Corp. So it’s unlikely you’ll be bored by 2019’s line-up. But if you’re a TV soap fan seeking distraction in your downtime, take the official Neighbors tour where you’ll stroll the real Ramsay Street and enjoy a star meeting with one of the show’s past or present actors. Unfortunately, there’s no guarantee it’ll be ex-star turned pop princess Kylie Minogue. You’ll also need somewhere chic and comfy to rest and revive in between stuffing your brain with the latest digital strategies and making deals with industry insiders. Luckily, Melbourne’s awash with beautiful hotels — as evidenced by this sublime selection from global design connoisseur site Wallpaper. And when it comes to fine dining, Melburnians don’t muck about either. If you want world-class cuisine and informal ambience, head to Attica in the suburb of Ripponlea. It was ranked number 20 by The World’s 50 Best Restaurants in 2018 — you’ll know why after savoring chef Ben Shewry’s authentic Australian fare. Or for something a little more quirky, book a table at Dinner by Heston. It’s not for the faint-hearted, but you might relish radical dishes like kangaroo saffron risotto drawn from the twisted mind of the establishment’s eponymous owner Mr Blumenthal. 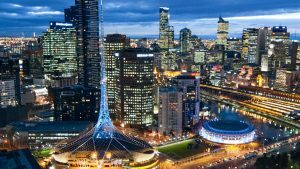 Melbourne might be Australia’s most creative city. So follow these top tips and you’ll broaden your cultural horizons and bag brilliant business ideas at next year’s Digital Marketing Innovation Summit. What’s your favorite Australian digital destination? Share your thoughts in the comments section.